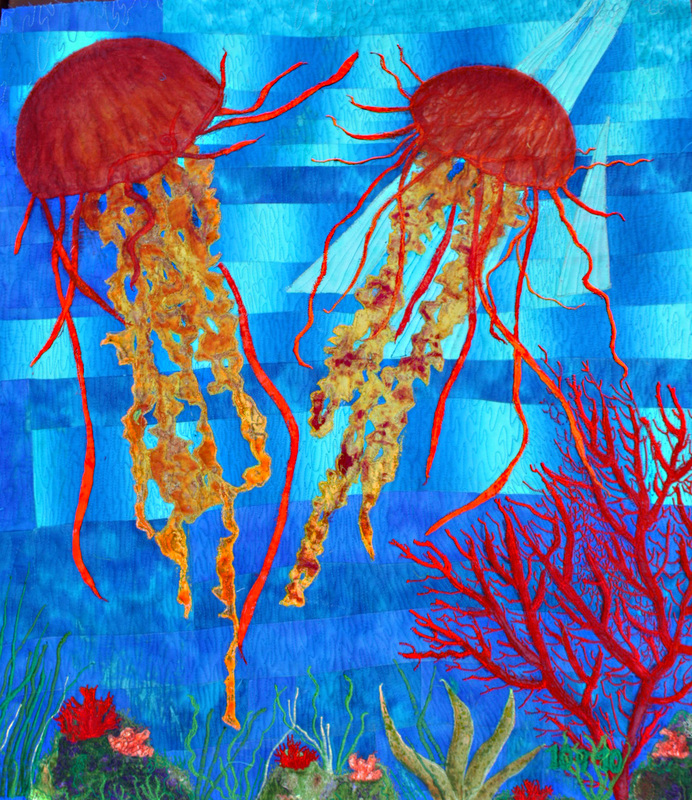 When I got the request for this custom order for 2 jelly fish featured in an art quilt, I would never have thought of doing a wall hanging with this theme. But the more I thought about the request, the more excited I got about the idea. I did some sketches, after looking at a lot of photos of jelly fish. My biggest obstacle was how do you capture the fluidity? How do you take fabric and try to make it almost translucent looking, and jellys almost look lit from within, how do you do that with fabric? It was intriguing and interesting, and fun to work out how to go about it. I think that’s part of the enjoyment of creating any sort of art; translating an idea into something concrete. Working out the “how am I gonna do that?” to “I did it and it’s good!!” . I love that big finish, when you look at it and say “It’s finished. and “I are really happy with it!”. Then I can’t wait to show someone. I’m like a little kid, “Look Mommie, see what I made” only in my case it’s “Look honey [Honey, in this case, being my hubby]see what I made?” Then I wait for his reaction. Is it as good as I think it is? That’s not as insecure and needy as it sounds. I don’t have to have approval. He is always honest with his opinion, and I like that. Tastes differ., and we don’t always agree. It’s OK , if I think it’s good, that’s enough for me. Well, I got the big thumbs up on this one. Hubby liked it, in fact he liked it a whole lot. I do too, but it’s nice to be validated. That’s not as needy as it sounds, really. 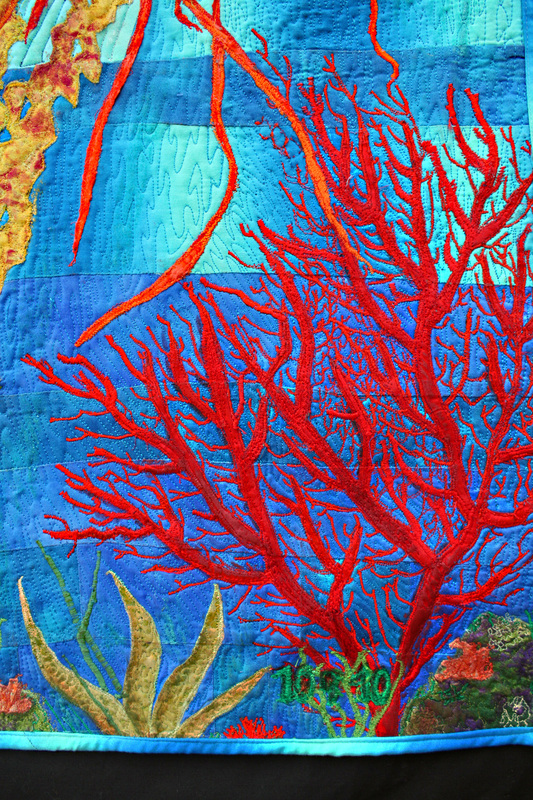 I figured out a long time ago when you create a work of art, a painting or an art quilt, create something that you really really like, and most likely others will like it too. I’m loving this quilt, and am mailing it out to the nice lady who ordered it, but deep down inside I don’t want to let it go quite yet, maybe I can get visitation rights!! What do you think? Plain crazy I’d say! I used to have the same problem with selling my paintings. Come to think of it, it was hard for me to let puppies go to new homes, every time my dachshund had a litter! So what do ya think? Do you like it? [really I’m not insecure, no really I am not insecure] Only kidding, well…I think I’m kidding@!?? Well if you really want to leave a comment, go ahead and do that, I won’t mind, that’s of course, only if you like it…. 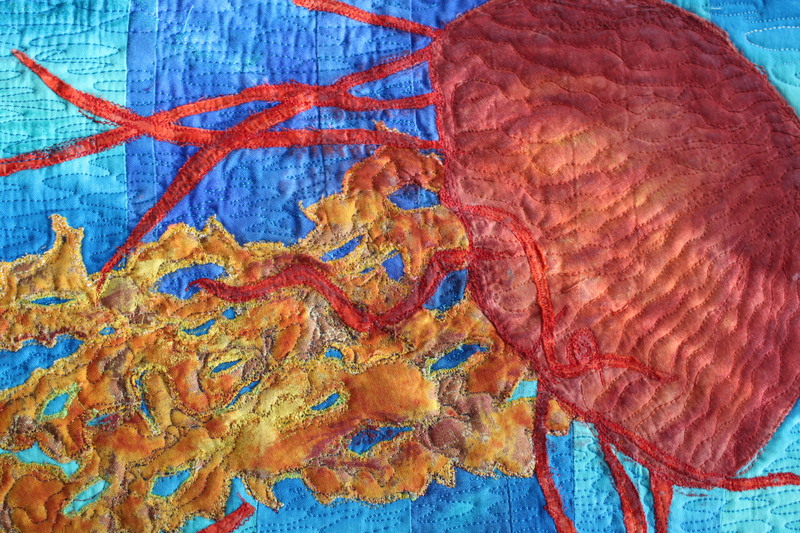 Here is the final installment of the jelly fish art quilt. I’m really happy with the outcome. 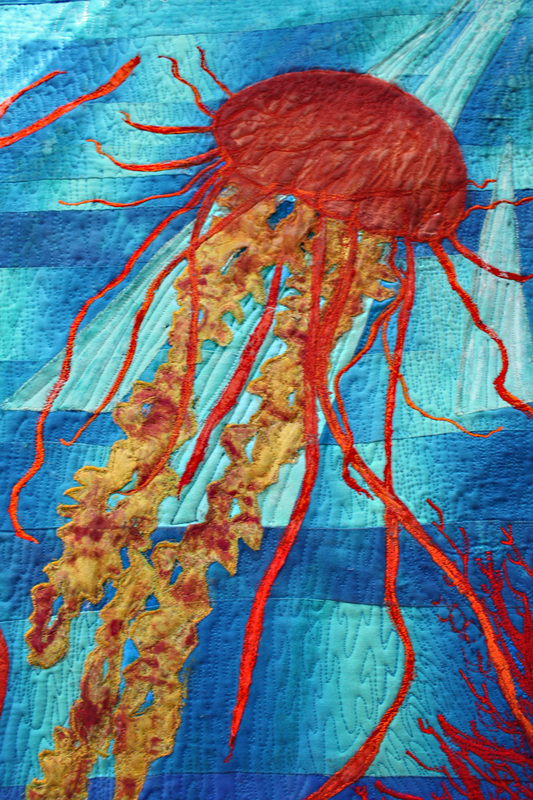 Categories: Archeives, Blog posts, Galleries, In Progress, Nature Gallery, Nature Quilts, New quilts, Older Posts-, Silk Paintings, What"s New? 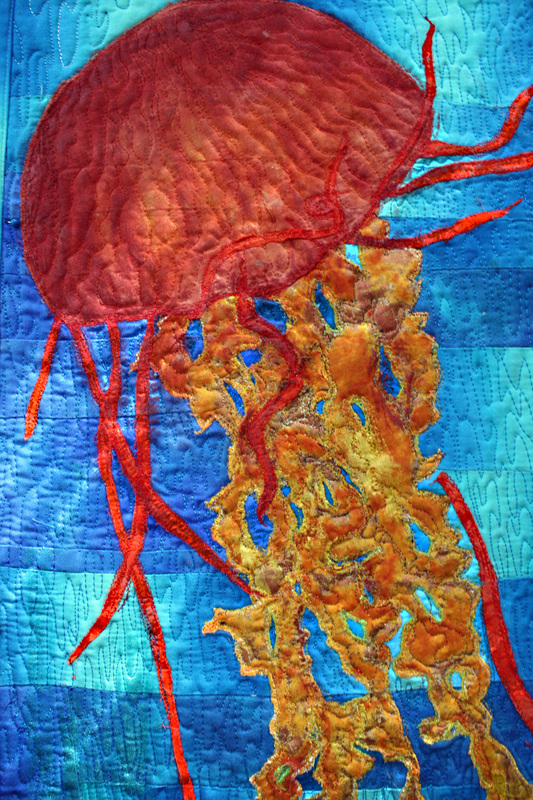 The jellyfish quilt is the most exquisite quilt I have ever seen! What an amazing talent you have! That’s one of the nicest comments I’ve heard. Thank you. Trish what a really nice compliment, I’m going to get a big head with comments like that, LOL not really! Hope you’ll come back and visit,I post new work as completed. Thank you so much, it was a commissioned piece & and some of the best ideas come from requests made by others. Chelsea, I’m glad you ended up here. Thanks for your nice comments, I’m working on my 2nd one and liking it even better. What makes it, I think is the silk painting, you can get color graduations and much more detail and depth. Although the first one was pieced entirely from commercial fabrics.I have to tell you 2 wonderful fabrics that worked so well. The first is a marbled metallic that is out of this world, It’s Mark Horgyszynski for Blank fabrics. it’s older but you can still find it on the web. And second is Stonehenge by Sunshine Cottage Northcott Fabrics. They’re both to die for. And you can get the Stonehenge on “1000 bolts but only 1 nut” for cheap right now. Hope yours turns out well, I’m sure it will!All the best.